The National Flag of Malta is defined in the Constitution and consists of two equal vertical stripes, white in the hoist and red in the fly, with a representation of the George Cross, edged with red, in the canton of the white stripe; the breadth of the flag is one and a half times its height. The George Cross decoration was awarded by King George VI for collective gallantry in 1942. Malta remained the only collective awardee of the decoration until it was awarded to the Royal Ulster Constabulary of Northern Ireland in 1999. 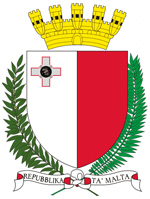 The current emblem of Malta is described by the Emblem and Public Seal of Malta Act (1975) as a shield showing an heraldic representation of the National Flag; above the shield a mural crown in gold with a sally port and eight turrets (five only being visible) representing the fortifications of Malta and denoting a City State; and around the shield a wreath of two branches: the dexter of Olive, the sinister of Palm, symbols of peace and courage to victory traditionally associated with Malta, all in their proper colours, tied at base with a white ribbon, backed red and upon which are written the words Repubblika ta' Malta in capital letters in black. The Merchant Flag of Malta, the civil ensign, was introduced by the Merchant Shipping Act and consists of a red field bordered in white, with a white Maltese Cross at its centre. This flag is flown by Maltese civilian vessels as their ensign. Maltese military vessels fly the National Flag. 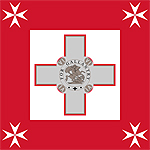 The jack flown by Maltese military vessels consists of a square flag, consisting of a George Cross proper fimbriated in red in the centre of a white square, within a red square. Each corner of the red square shall contain a white Maltese Cross. 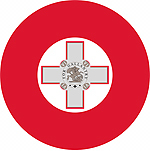 Maltese military aircraft carry a roundel on the wings and fuselage, consisting of a George Cross proper fimbriated in red in the centre of a white disc, within a red disc. Whenever then national flag is painted on the side of an aeroplane, the hoist should be towards the front of the plane with the fly flowing aft.